Click, click, click...Hold on to your stomachs, because the ride of your life is about to drop. In Coaster Park, you are tasked with building the biggest, baddest roller coasters. To do this, you must assemble a killer crew to help you outbid and outsmart your fellow builders to gain the choicest track pieces. But don't forget about physics! If your marble fails to make it to the end, you've got a dud on your hands and must re-engineer your path to victory. 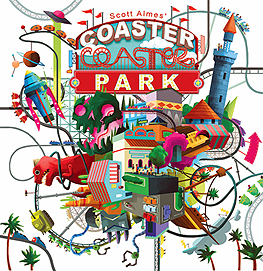 Coaster Park, from designer Scott Almes (Tiny Epic Kingdoms, StarFall), is a strategy game of epic delights for 2-4 thrill-seekers.